Modern Aircraft Electrical Systems - How well do you know your aircraft? I recently realized that I have been flying for over 30 years and I have been an A&P mechanic for 25 of those years. In all the time that I have spent around aircraft and the people who love them, I have rarely found pilots who understood the electrical systems of their aircraft. Why should they, one might reason, since the manufacturers of most light general aviation aircraft did not provide enough accurate information to the pilot to make any difference until an alternator or generator failed. Until recently, a manufacturer was content to provide an ammeter or a voltmeter, but seldom both. For a while, Cessna provided us with an over-voltage light, which, while coupled with the ammeter, would supposedly tell us about certain electrical malfunctions. In general, it wasn't until we got into more complex aircraft or twins would we be provided with enough accurate information about our electrical systems operation and health to make intelligent operational decisions. With the introduction of Technically Advanced Aircraft (TAA) outfitted with sleek Garmin' G1000TM, Avidyne', and other assorted glass cockpit panels and FAA/Industry Training Standards (FITS) scenario-based training techniques to help pilots fly more safely, the training industry has finally recognized that pilots must be trained to a higher level of understanding of the electrical systems that supports all that equipment. This article will help pilots better understand how to evaluate these threatening situations, if and when an electrical failure forces them to make load shedding decisions to complete the flight safely. When I teach these FITS/TAA ground school pilot programs, I start with a definition of the ultimate worse case scenario: Apollo 13 and its dramatic return to earth after suffering catastrophic damage resulting in crippling power failure. Most pilots nod their heads as they remember Tom Hanks playing the role of Jim Lovell in the blockbuster movie which memorialized that day when Americans, and in fact people from around the world, were glued to their TVs and radios watching and listening to the mission control experts trying to figure out how to get power out of the remaining charge left in the ship's batteries. In the same way, we as pilots may one day be called to make similar decisions (without the world watching) in order to get our aircraft and our passengers to safety after suffering a simple alternator belt failure. As with Apollo 13, our aircraft battery has a finite capacity of power and it becomes our job to make decisions on the restriction or limitation of the aircraft's power consumption that allows us to make it to safety. Now many pilots think this will never happen to them. Ask any group of pilots for a show of hands who in their aviation career have suffered an electrical failure and you will almost always get one half of the group to acknowledge and are quick to offer up some hair-razing story about their adventure. Further ask them to describe the specific defects they suffered and you would expect to get a list of answers ranging from dead batteries and broken alternator belts to broken wiring terminals and popped circuit breakers to dead short-circuits to problems with regulation and power control devices. Surprisingly, many of them cannot even tell you what happened because 'it just went dead' and the mechanic never told them what they found. It is amazing, in an industry that depends upon electrical power to keep life simple in the cockpit, that pilots and the flight instruction community are so nonchalant about understanding the central nervous system of the machines we fly. Let us start with a few basics and then we can see what a pilot needs to know to be ready for the day when the screens start to go dim. The electrical system of every modern vehicle has a number of key components: A battery for storing power, a generator or alternator to produce power after engine start, regulation equipment to control the power output and provide a trickle of that power back to the battery to keep it at peak charge, circuit breakers to protect systems from abnormal power draw arranged into logical system groups called buses, power consuming devices located throughout the aircraft otherwise known as 'appliances,' and wiring to direct power from the circuit breaker bus to the appliances via the switches and then back to ground completing a circuit. That is essentially the design of everything from motorcycles to spacecraft. The only difference is in the details incorporated by engineers to provide safety and redundancy based upon the vehicles mission needs. 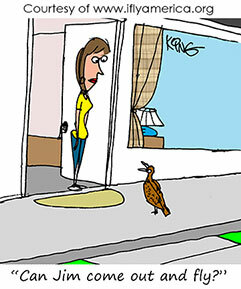 An auto or motorcycle can pull over to the side of the road so very little redundancy is built into the system. A spacecraft and an airliner have secondary and tertiary systems built into the system because failure tolerance must be minimized. A general aviation aircraft, depending upon the intention of that aircraft to accept adverse conditions as part of its mission profile may have secondary portions of its systems to provide redundancy. The more sophisticated (expensive) the aircraft, the higher the chances that it will be flown in 'hard' IFR, mountainous terrain, night-time, or over-water conditions, the more likely the electrical system will have backup components to protect the pilot. As general aviation continues its venture into offering glass cockpit panels and TKS anti-ice systems, you start seeing corresponding increases in electrical component redundancy. Mooney, Columbia, Cirrus, and Beechcraft all are outfitted with dual alternators and dual batteries. Symphony, Diamond, and Cessna are outfitting their G1000 and Avidyne equipped aircraft with standby batteries providing varying amounts of protection to the pilot in case of electrical problems. So if the systems are designed by engineers to be safe and redundant, then what goes wrong? We can break failure modes into a number of categories. This in turn can help pilots develop a strategy for combating the failures. The main failure modes are: battery decay and failure, alternator or generator internal or drive failure, regulation and control failures, popped circuit breakers caused by system overloads, wiring issues caused by wear and tear or insulation breaches, switch failures, or appliance internal failures themselves. So what exactly does a pilot need to know, one might logically ask themselves? Pilots are not mechanics and the last thing they need to know to fly is a lesson in Ohm's law. I hear it all the time. Pilots want to simplify their lives, not make it filled with technical detail. OK, let's make your life simple. There are two things that a pilot needs to know about electrical systems during normal operations: system voltage and alternator output (amps). You keep these items in your scan flow and ensure that voltage and current are in proper parameters and you can focus on the rest of the mission profile'getting safely to your destination. Short of a G1000 or Avidyne' Entegra panel flashing warnings at the pilot letting them know that something is awry, what parameters of performance are we looking for? Basically, the pilot has control over key aspects of system performance prior to receiving a cautionary alert from the system. Let's look at the key areas the pilot can incorporate into their Aeronautical Decision Making (ADM) knowledge base. Almost all IFR certified aircraft manufactured since 1990 are 28-volt systems. That means the battery has an internal voltage of 24 volts. Then why are the system 28 volts and why does this matter? The first 24 volts provides the voltage required to run all the aircraft appliances and the last four volts provides the push necessary to trickle charge the battery keeping it at a peak charge ready for the next aircraft start (or restart) or to stand ready as the reserve for running the systems should the alternator or its support systems fail. How long will a battery stay at 24 volts should the alternator fail? Batteries are rated in terms of amp/hours'in other words how many amps will the battery supply for one hour in order to supply a rated amount of voltage. The average 24-volt GA battery installed in a production four-place IFR capable aircraft provides about 15 amp hours of power at a full charge (usually until a preset voltage limit such as 20 volts for a 24 volt battery). That begins to diminish as soon as the battery is placed into service. That also diminishes rapidly in cold temperatures. The state of charge of the battery at the time of the alternator failure will determine the number of minutes the battery can keep the systems going before screens go dim. The pilot should be wary, as the amp hour rating (even at a full charge) is not necessarily linear. As the battery starts to work to power everything in the aircraft, such as might occur with a failed alternator, the voltage also starts to drop and many radios and other appliances drop off line at particular voltages, but long before the battery is actually dead. The G1000 has built in load shedding capabilities. At reduced voltages, say below 22 volts, the transmitter outputs are reduced automatically from 16 watts to 10 watts and the screen brightness is drastically reduced. Below 20 volts, many appliances simply cease to function. If the pilot attempted to takeoff with a discharged battery, such as might occur after a prolonged departure delay with all lights aglow with the engine at idle, the battery may only keep the systems going for a few minutes and that would just get worse in cold temperatures. Not a place that a prudent pilot wants to be, is it? Another avoidable situation is when pilots attempt a takeoff immediately after getting a jumpstart. That battery has not had a chance to fully be restored to a reasonable charge level. A prudent pilot would request a proper charge (in accordance with the battery manufacturer's recommendations) prior to attempting a departure. To not do so is asking for trouble. The rule of thumb is that if the battery is not strong enough to start the engine, then it is definitely not ready to support the needs of the flight should the alternator fail. In fact, many FAA inspectors would argue that the aircraft is not airworthy without a properly charged battery prior to flight. This leads us to the concept of 'critical idle speed.' Critical Idle Speed (CIS) is defined as the minimum speed at which the aircraft engine can be idled so that the alternator will provide the power to completely power the systems and still replenish the battery back to full charge. This speed is definitely not the minimum idle speed of the engine. Take for instance a Cessna C172SP. The G1000 panel does a great job of letting us know both the system voltage and the current (amp) draw at all times. If the pilot is waiting for takeoff clearance and sits with the throttle pulled all the way to the stop with just the beacon light on, the RPM would be about 675 RPM. Look at the ammeter and you would see that you are drawing a negative current of about 9.0 amps. Push the throttle forward slightly to about 900 RPM and the pilot would see the amp draw advances to +1 amps. The point where the amp draw switches from negative to positive is defined as the 'critical idle speed.' If pilot should allow the battery to be drawn down by a negative charge situation prior to takeoff, the battery is in a disadvantaged condition. Other than taxiing, the pilot should use this or even higher RPM speed, as the minimum idle setting awaiting takeoff release. On a Diamond aircraft or on Pipers where the ammeter starts at 0 and only shows positive, the critical idle speed is the speed at which the voltage reaches 28 volts, if a voltmeter is installed. On these systems, when the speed is idled too low, the voltage falls from 28 volts and the ammeter only reflects system consumption. Our G1000 equipped Diamond DA40 requires an idle speed of over 1,000 RPM in order to ensure a fully charged battery condition. These idle speeds will vary with equipment turned on and the temperature outside. The worse case scenario will be a cold night flight. This would require the highest idle speed to keep the battery at peak charge prior to brake release. Any failure in the charging system would result in a fallback to the raw battery voltage of 24 volts (on a good day) and would require the pilot to start the process of 'load shedding' to effectively conserve power until a safe landing can be made. Load shedding is defined as deciding what systems to shut down and in what order to reduce the power consumption of the finite power remaining in a battery. Some systems can be shut down using the appliance switch, such as pressing the power button off on the autopilot, and some may require a toggling of another system control switch such as the avionics master switch (or 1/2 of it) or the alternator side of the master switch. A pilot must avoid the use of pulling a circuit breaker for the purposes of removing power. How does the pilot know what to turn off and in what order? This is a great question and the answer leads to the reason why this training is so fundamental to safely flying TAA aircraft. The answer to this question comes directly from my friend and colleague Gregg Maryniak, Executive Director of the XPRIZE Foundation and Executive Director of the St. Louis Science Center McDonnell Planetarium. 'If it spins, heats, or lights - turn it off,' says Gregg, an electrical engineer and space scientist. The simple truth is that nonessential (at that moment) electric appliances such as lights, gyros, flap and gear motors, autopilot servos, and fuel and gear pumps are the heaviest consumers on the vehicle and must be the first to be eliminated to buy time and reserve power needed later in the flight. Because of the design of these systems, simply turning off the power switch may not be enough. A great example is the autopilot. When the average autopilot is turned off at the panel on/off switch, there may typically still be power flowing to remote sensors, trim servos, and feed circuits. In order to stop all this power flow, it may be necessary to pull the circuit breaker. Another example is the alternator side of the master switch. In a condition where the alternator were to fail or the drive belt were to break, leaving the ALT switch on may result in a consumption of almost 1.5 amps of power flowing to fill the coil windings of the device and the regulators and other control boxes of the system. Considering that the average aircraft battery only has 15 amp/hours available on a new battery with a full charge, that 1.5 amps could be used elsewhere such as one last radio transmission or having enough power to extend the flaps right before landing. One of the things that we have learned with the introduction of the G1000 and Avidyne' Entegra panels and the digital electrical system displays that support them is exactly what power consumption each appliance uses. We used to hear instructors teach pilots to turn off the transponder first after an alternator failure'it is the highest power-consuming appliance because it both receives and transmits. That may have been true in the days of the older analog style transponders, but it is not true anymore. What we now see by switching on and off these solid state components is that the transponder and each of the other radios of the system only consume about .5 to .75 amps of nominal power where a landing light and a taxi light each take almost seven amps. That means that after a failure of an alternator, a pilot's judicious load shedding of external lights could almost triple the amount of time the battery could support the radios. Now we are getting at some useful information that a pilot can use. Traditionally, general aviation aircraft had two banks of circuit breakers: the main bus powering everything electrical on the aircraft, and the avionics bus powering the radios. These systems provided a simple separation of the two groups of systems by an avionics master switch. As aircraft avionics grew more complex, we saw a trend where the avionics panel was split into multiple groups and were powered by multiple avionics master switches. This provided a very quick way to isolate or load shed a group of essential avionics from a group of nonessential ones. As the electrical needs of these modern aircraft have evolved, the manufacturers have again split circuit breakers in the main group into several groups to give the pilot ever more control over the electrical systems that power their aircraft's systems. The most common approach is to split the main bus into a main bus and a secondary bus or to split it into an essential bus and a main bus to make it easier for pilots to accomplish load shedding during an emergency. What is happening is that the power is being split so that under normal conditions, all appliances are available, but under emergency conditions or in situations where the aircraft secondary battery or alternator is being used, the 'load-shedded' systems or faulty components can be isolated from essential parts of the system to avoid current draw or secondary failure implications on the remaining system. In many aircraft, white lines on the circuit breaker panel to help the pilot understand what appliances are on which bus separate these busses. This also helps the pilot develop a load shedding strategy in the event of an electrical emergency. The pilot of these aircraft must take the time to study these bus arrangements so that when the time comes, they have a defensive plan to get home safely. We mentioned before that many manufacturers of Technically Advanced Aircraft are outfitting their aircraft with standby batteries. How do these work and how much time does this provide us should an alternator and primary battery fail? In some cases, the second battery is not a full size battery, but in fact may be only a fraction of the capacity of the original with an intent to provide just enough time for the pilot to fly for an extra 2030 minutes under a severely diminished system availability. 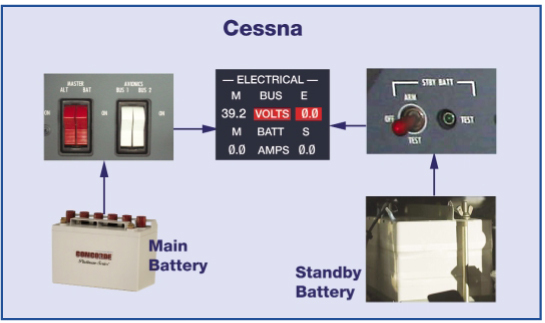 A great example of this is the Cessna standby battery installed on the C172, C182, and C206 G1000 equipped aircraft. The second battery provides enough power to run the essential bus for up to 30 minutes. What many pilots who are being introduced to these aircraft may not know is that there is no way for this battery to power any external lights, flaps, pumps, or other systems deemed non-essential. These nonessential systems are simply not connected to the backup battery. The only way to know this is to read the manual or to actually study the layout of the essential and the main bus lines on the instrument panel. What does this mean to the pilot? It means that in an actual electrical emergency, such as an alternator failure, the pilot may need to make a decision to isolate the main battery and exhaust the standby battery FIRST and then turn the main battery back on at the last minute in order to extend flaps or illuminate any external lights for landing. This would be helpful information for the pilot to know prior to having a failure. It would not be a good time for that pilot to be reading the pilot-operating handbook with a flashlight gripped in their teeth. Diamond Aircraft uses a different standby battery arrangement. They use a standby battery similar to an ELT battery to power the standby attitude indicator and LED panel lights. The pilot must activate the emergency battery switch by lifting a switch cover. This battery is not charged by the alternator, but by design provides power for up to 90 minutes. After the main battery is exhausted, the standby battery cannot power any radios or aircraft systems. It simply is there to allow the pilot to use the standby instruments to find a VFR airport and land. Less prevalent, but still worth our consideration, are the issues that can occur related to the connective portions of the electrical system between the power buses and the appliances themselves. The circuit breakers are installed in a circuit to prevent current or voltage overloads from traveling to an appliance that is not designed to accept such a load. What would cause a device to suddenly receive a surge from the power bus? Anytime that a device or a wiring fault occurs that allows a direct flow of current from the power bus to ground will cause such an overload. The risk of this to a pilot is twofold. One is that high current causes excessive heat to build up along its path. That heat can cause wires or components within a device to melt or flash-arc to adjacent wires. The second is that the melting of the wire insulation or coating and the other components can cause smoke or even spark a fire in the engine compartment, under the panel, or somewhere in the cabin. Neither of these leaves the pilot any choice but to shut down the electrical systems and start immediately looking for landing options. The circuit breakers of a circuit are designed to interrupt power anytime that rated current is exceeded even for a moment to prevent an overheating of the wires, switches, or the appliance itself. There are two type of circuit breakers currently used in aviation. These are 'trip-free reset table' some with plungers and some without. When the pilot can selectively pull a circuit breaker, it creates the illusion that it is a switch. In most cases, FAA Advisory Circular 43.13 discourages this practice because the device could have its internal contacts worn over time so that it no longer could effectively serve its true purpose in the event of excessive current draw. In TAA glass cockpit training we are faced with a dilemma. We need to teach the pilot to completely understand what the panel looks like when an air data computer or AHRS unit fails so that they respond correctly. Short of dimming screens, there is no other realistic way to selectively fail components during training other than to use the circuit breaker. We urge instructor pilots to use ground training devices and paper tiger trainers rather than to risk the integrity of the circuit breaker panel itself. The circuit breakers of the power buses are supposed to be labeled with an appliance description and a number representing an overload rating. In most cases the circuit breaker label is self explanatory, such as landing light, taxi light, starter, fuel pump, etc. The problem is where avionics shops add circuit breakers over time on older aircraft and the labels are missing or unreadable. It should be the focus of the IA on each annual inspection to make sure that all placards and markings of the aircraft not only be present, but also be legible. Should a pilot fly an aircraft with a circuit breaker that serves an unknown purpose? Title 14 CFR '23.1357 (d) requires that all circuit breakers and other protective devices be clearly identified in order for the aircraft to be airworthy. If the pilot cannot determine what a circuit breaker does, the aircraft should not be flown. The pilot of a modern aircraft must understand the layout and the operation of their electrical system in order to have peace of mind in the event of an electrical failure. The systems of our currently produced aircraft are so complex that 'hop in and learn as we go' training should no longer be practiced by flight instructors and should be prevented by flight training and rental companies. This might have worked for simple training aircraft manufactured in the 70's, but simply is not consistent with prudent risk management strategies today. The flight instructor, armed with the knowledge of FITS training techniques, should use emergency scenarios to train the response of the pilot in training to understand the electrical system down cold. In the modern world of flight training, we call this to practice to the Manage Decide Level of FITS accomplishment. The pilot in training should know the systems just like they do landing procedures or engine out glide to landing procedures. The principles discussed here are not limited to TAA glass cockpit aircraft but can apply to any aircraft with an electrical system. The pilot must have a working knowledge of the electrical system and its essential, main, and avionic bus layout in order to have the highest chance of combating an electrical system malfunction in other than day VFR conditions. The easiest way to learn the layout is to read the POH and study the white lines or logical divisions of the circuit breaker panels. Keep the circuit breaker panels and the electrical system indicators in your scan flow just like you would the other engine indicators. If the aircraft is outfitted with backup alternators or backup batteries, be aware of the limitations that these may place on your operation of systems and have a good idea of how long you can effectively operate the aircraft in the backup scenario. I can only urge you to really give the aircraft a complete going over on the first flight of the checkout or pilot recurrency check flight. Now, if your next trip turns your aircraft into Apollo 13, you will be ready to return to earth safely and with confidence! Mike Gaffney is an FAA Aviation Safety Counselor, A&P mechanic, ATP pilot with a CFI, CFII, and CFMEI and over 3,200 hours to his credit. 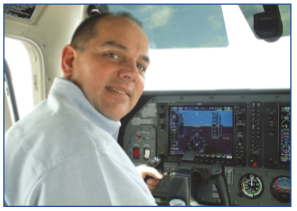 He is the author of the ASA software course 'The Complete G1000' and is a FITS Accepted Instructor (CFAI) for the Garmin' G1000TM in Diamond and Cessna aircraft. He was designated a Master CFI by the National Association of Flight Instructors, and is the President of Skyline Aeronautics and Beuco Supply Company at Spirit of St. Louis Airport. He can be reached at mgaffney@skylineaero.com.